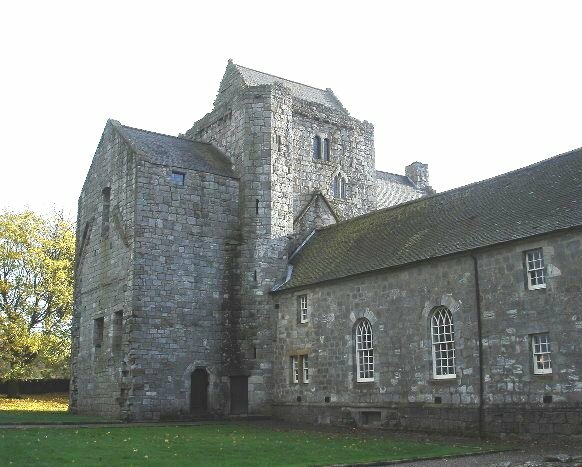 Church overview: Torphichen Preceptory is the tower and the two transepts of the church of the Preceptory of the Knights Hospitaller of the Order of St John of Jerusalem. The Preceptory was constructed from the late 12th century and comprised an aisleless nave, central tower, transepts and choir. Alongside are the foundations of the Preceptor's quarters, a dormitory, dining hall and kitchen, forming a cloistered courtyard on the north side of the church. The transepts and nave were rebuilt in the 15th century. The nave of the Preceptory was later demolished to make room for Torphichen Kirk which was built on the original foundations in 1756. The kirk is T-shaped with three galleries including a laird's loft. Two centre pews can be tipped back to form extended communion tables. Sanctuary stone in the graveyard and a fine collection of 17th-18th century headstones. The parish, containing also Blackridge village [NS 89276 67164], 6½ miles to the southwest, is bounded on the north and east by Linlithgow, on the southeast by Bathgate, at its southwest extremity by Shotts and New Monkland in Lanarkshire, and on the northwest by Slamannan and Muiravonside in Stirlingshire. Its utmost length, from east-northeast to west-southwest, is 9⅜ miles; its breadth varies between ¾ mile and 2⅜ miles; and its area is 15½ square miles or 9,956¼ acres, of which 17¾ are water. The river Avon or Aven winds 3½ miles east-north-eastward along all the Muiravonside boundary; and its affluent, Polness or Drumtassie Burn, runs 4¾ miles north-eastward along nearly all the Slamannan boundary. Barbauchlaw Burn, coming in from Lanarkshire, runs 7⅜ miles north-eastward along the Shotts and Bathgate boundary, until it unites with Couston or Ballencrieff Water to form Logie Water, which, flowing 6½ furlongs north-north-westward across the narrowest part of the parish, falls into the Avon near Crawhill, and divides the parish into two unequal portions, the smaller to the east, the larger to the southwest. Along the Avon the surface declines to 300 feet above sea-level, and thence it rises eastward to 777 at the Torphichen Hills (NS 97637 72658), 749 at Bowden Hill (NS 97758 74407), 912 at CockLerue (NS 98945 74390), and 1016 at Cairn-naple or Cairnpapple (NS 98726 71741) and (NS 98899 71149); south-westward to 648 feet near Wester Righead (NS 90863 70937), 705 near Canties (NS 91316 69275), 824 at Eastcraigs Hill (NS 90349 68016), and 759 near Bedlormie (NS 87486 67602). 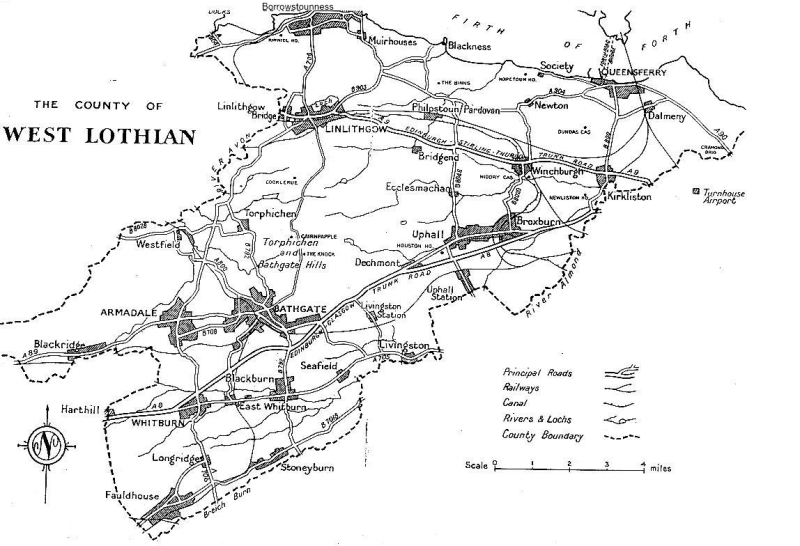 Torphichen thus sends up the highest points in West Lothian, and, compared with the general aspect of that fine champaign county, is markedly tumulated, and boldly hilly at the northeast end. The south-western district is naturally moorish; but, making abatements for cold wet moor towards the west, and some little extent of hillpasture on the east, the parish is generally fertile, and has an enclosed, warm, wealthy appearance. A judicious distribution of planted trees has materially served both to shelter and to beautify. The summits of the hills command a most magnificent prospect of the Lothians and Fife, of the Ochils and the frontier Grampians, and generally of the basin of the Forth, from the sources of the river at Ben Lomond to the mouth of the Firth at North Berwick Law. The rocks are partly eruptive, partly carboniferous, and they exhibit in the eastern group of hills a very interesting series of superpositions. Trap, limestone, and sandstone are quarried; coal is mined; ironstone also occurs; and silver ore exists, but in so small a quantity that an attempt to work it was soon abandoned. The soil is very various, and ranges from fertile alluvium to barren moor. Adjacent to the village on the northeast are some remains of the hospital or preceptory of Torphichen (NS 96843 72555), from 1153 the principal Scottish residence of the Knights of St John of Jerusalem. Of the cruciform church of the preceptory, the chancel and the nave are entirely gone, and there only is left a portion of the transept or "quier" which, measuring internally 66 feet by 20, is Early Second Pointed in style. The nave appears to have been 112 feet long; but its site is now occupied by an edifice of very different character from it - the plain modern parish church. The traceried window of the southern transept makes some pretensions to beauty, and the four piers supporting the central tower display some architectural grace; but the other parts which remain of the edifice do not prove it to have been conspicuous either for size or for beauty. The belfry or steeple is ascended by a narrow spiral stair, and has comparative meanness of altitude and aspect. Within the choir are the baptismal font, a curious recess where corpses were laid during the celebration of the burial mass, and the monument (1538) of Sir Walter Lindsay, the last preceptor but one. Fragments of massive old buildings in the village, and the stones in the fences over the face of the adjacent country, indicate how great and magnificent a seat of population once surrounded the church. A stone, resembling a common milestone, but with a cross carved on its top, stands in the churchyard, near the west end of the present church, and is thought to mark the centre of a privileged sanctuary ground attached to the preceptory [NS 96846 72500]. Similar stones marked the limits or corners of that ground, each 1 mile distant from the centre; and all the space within the circle drawn round these outlying stones was as much a legal sanctuary as the church at its centre, and afforded protection against the law to every criminal or debtor who entered and remained within its precincts. Editor's note: The "Refuge Stone" [NS 96846 72500] is an ancient standing stone also known as the "Torphichen Sanctuary Stone", located at the west-side of the kirkyard and preceptory of Torphichen parish church, 2¼ miles to the north of Bathgate. The stone has five small prehistoric cup-marks, but also a Celtic-style carving from the Dark Ages when St Ninian lived here, while on the top of the stone there is a medieval incised cross and a small hollow. It is the central-most stone of three - the other two being within a 1 mile radius of the preceptory. It is believed that the stone came from the ancient site of Cairnpapple Hill, about 1½ miles to the east. Torphichen's medieval church and preceptory are located at the east-side of the village on The Bowyett, off from the B792. The stone is set amongst the gravestones at the west-side of the grassy kirkyard. The little standing stone was set up here in the 12th century by the Knights Hospitallers (Knights of St John) to mark out a place of sanctuary or refuge for local people and pilgrims from further afield who wished to seek 'a place of safety here', or more likely the stone was already here when the Knights founded their preceptory/hospital and church in 1168; an incised cross was carved on the top of the stone and the little hollow carved to either hold a cross or maybe holy water. 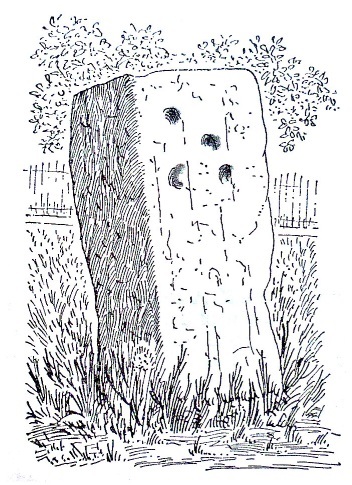 But the stone was used at an earlier date by St Ninian, who had settled here in the 4th century and, in the 7th century St Fechin, an Irish monk and missionary from the monastery of Fore, County Westmeath, apparently also made use of this standing stone - the Celtic-style carving on the stone would date from this time. The five small cup-marks on the side of the stone date from the early Bronze Age when it stood on Cairnpapple Hill where there is a Neolithic henge monument and Bronze Age cairn. The preceptory which was the Knight's Hospitallers Scottish base, is now in ruins although the central tower, west tower-arch and transepts remain; the nave was rebuilt in the 17th century and now forms part of the present parish church. Some of the domestic buildings and parts of the hospital also still stand. The knights were introduced to this establishment by David I, and had many possessions conferred on them by him and his successors; and after the suppression of the Knights Templars in 1312, they inherited the extensive property of that great rival Order. In 1291 and 1296, Alexander de Wells, "prior hospitalis Sancti Johannis Hierusalemitani in Scotia" swore fealty to Edward I; and in 1298 he was slain in the battle of Falkirk. From precepts which Edward issued to the sheriffs to restore the property of the Knights, the preceptory of the Order seems, even at that early period, to have had estates in almost every county except Argyll, Bute, and Orkney. Radulph de Lindsay was preceptor under Robert I Sir Henry Livingston was preceptor under James II, and died in 1463. Sir Henry Knolls, the next preceptor, governed the Order in Scotland during half a century, and was commonly called Lord St John. Treasurer to James III from 1468 to 1470, he joined the party who hunted down that monarch to his unhappy end; in 1489 - 90 he was appointed to collect the royal revenues in Linlithgowshire; and after being much employed by James IV, he fell fighting by his side on the Field of Flodden. Sir George Dundas, his successor in the preceptorship, was the school-fellow of Hector Boece, and is praised for his learning. Sir Walter Lindsay, the next preceptor, was a "valient capitane by sea and land" and rose to be Justice-General of Scotland. Sir James Sandilands, the last on the list, joined the Reformers in 1560; and on his paying down 10,000 crowns and engaging to pay an annual rent of 500 marks, he received the remaining estates of the Order as a temporal barony, and was raised to the peerage under the title of Lord Torphichen. The civil antiquities, besides those noticed under Bedlormie (House: NS 88486 67231), Bridge Castle (NS 94255 70943), and Oghface, are the old peel-like mansion of Kipps (NS 98714 73912), fine sites or remains of four hill-forts or camps, and remains of a stone circle (Cromlech Druid Temple: NS 99006 73868) in a field adjoining the mansion of Kipps. The parish is traversed by the middle road from Edinburgh to Glasgow, by the road from Bathgate to Falkirk, and by 7½ furlongs of the Blackstone and Bathgate branch of the North British railway. Henry Bell (1767 to 1830), who introduced steam navigation into Europe, was a native. and 6 proprietors held each an annual value of £500 and upwards, 18 of between £100 and £500. Torphichen is in the presbytery of Linlithgow and the synod of Lothian and Tweeddale; the living is worth £192. The parish church, built in 1756, contains about 360 sittings. The Free church (NS 96611 72292) is one of the earliest in Scotland; and at Blackridge there is a Free Church preaching station (NS 89021 67136). Three public schools - Blackridge, Torphichen, and Woodend - with respective accommodation for 80, 140, and 120 children, had (1884) an average attendance of 52, 120 and 115, and grants of £47 2s, £109 12s and £102 2s 6d. TORPHICHEN, a parish, in the county of Linlithgow; containing, with the village of Blackridge (NS 89249 67174), 417 inhabitants, of whom 397 are in the village of Torphichen, 2¾ miles (north by west) from Bathgate. This place, which is supposed to have derived its name from its hills, was anciently the seat of a commandery of the Knights of Malta and St. John of Jerusalem, founded in the year 1153 by King Malcolm IV, and more largely endowed by his successors, Alexander II and III. The establishment received additional grants of land, and various immunities, from succeeding sovereigns till the time of James IV, by whom the privileges were confirmed; and the possessions of the commandery were ultimately erected into a lordship, designated the Lordship of St. John and Commandery of Torphichen. In 1298, Sir William Wallace made the place his head-quarters for some time previously to the battle of Falkirk, in which Alexander de Wells, then commander of Torphichen, was killed. Many of the commanders were distinguished for the important offices they filled in the state, and as members of the council and of parliament; the last, Sir James Sandilands, took an active part in promoting the Reformation. 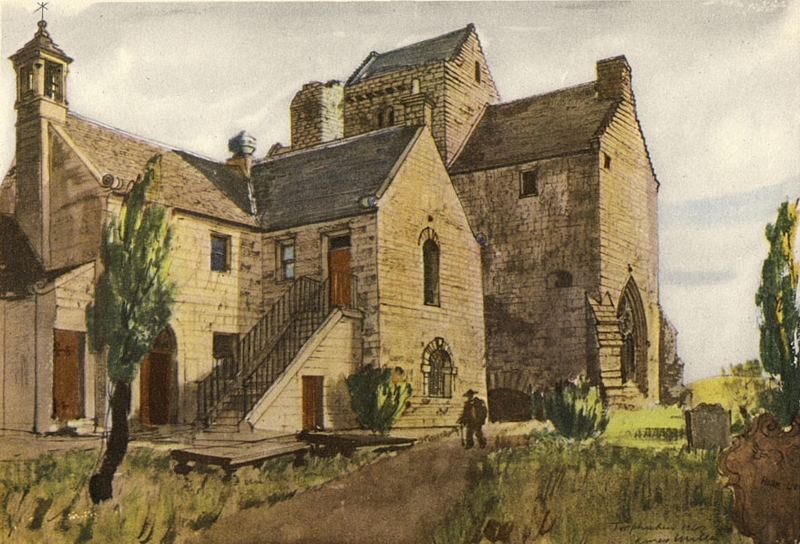 Sir James was succeeded in the lordship of Torphichen by his nephew, Sandilands, of Calder, who made Calder House (NT 07253 67252), which had long been the patrimonial residence of the family, the seat of the lordship. The commandery was now abandoned, and soon fell into decay; the only remains are the choir, which, however, is almost perfect, and is about sixty-six feet in length and twenty feet in breadth within the walls, which are of great thickness. The interior contains many interesting architectural details in the richer Norman style; and at each end is a beautiful window enriched with tracery, beneath one of which is an arched and canopied recess, where the remains of the commanders were placed, during the performance of the funereal rites previously to their interment. In the cemetery is a low square pillar of stone, with a Maltese cross rudely sculptured: from this were measured the limits of the sanctuary of Torphichen, marked by stones similarly sculptured, and within which all persons charged with offences not capital were safe. The parish is about ten miles in extreme length from east to west, and varies from a mile and a half to about two miles and a half in breadth, comprising an area of 10,430 acres, of which the greater portion is arable, and the rest composed of extensive tracts of hilly moorland, pasture, and plantations. The surface is diversified with ranges of hills, the highest, called Cairn-Naple, having an elevation of 1,498 feet. Towards the north are Cockleroi and Bowden hills, from the summits of which are interesting views extending from North Berwick Law to Ben-Lomond, and embracing the city and castle of Edinburgh with Salisbury Craigs and Arthur's Seat, the Frith of Forth, the Fifeshire coast, the Ochils, the ancient town of Stirling, and the Grampians. The ridge of hills immediately above the village forms a continuation of bold circular eminences, and on the western side gradually diminishes into gentle undulations, among which are seen, with beautifully picturesque effect, the village, the church, and the venerable remains of the commandery. The small river Avon flows along the northern boundary of the parish, dividing it from that of Muiravonside; and the Loggie burn, a still smaller stream, for several miles separates the parish from that of Bathgate, and flows into the Avon near Craw Hill. About a mile to the north-east of the village is Loch Cote, a sheet of water about twentytwo acres in extent, surrounded by the hills of Bowden, Cockleroi, and Kipps, and which, after having been drained, has been restored by the present proprietor. The soil around the village is extremely fertile; and that in other parts, though wet, is well adapted to the growth of timber of every kind. The lands have been mostly inclosed, and improved by draining, and produce favourable crops of grain; the farms are generally small, but the farm-buildings are nevertheless substantial and commodious. Those parts not in cultivation afford good pasturage for the sheep and cattle, which are usually of the common breeds: of the latter, several of the Ayrshire kind have been recently introduced. There are quarries of limestone in the Hilderston and Bowden hills, the latter of which is worked by an adit from the side of the hill; and on Hilderston, and in the hollow between the Kipps hills and the Torphichen range, are coal-mines. At the former of these the coal crops out at the surface, which has an elevation of 800 feet above the level of the sea. There is also a mine on the lands of Bridgecastle; but the coal, though of good quality, is thin, and the mine not now in operation. In the parish are two quarries of granite, and one of sandstone; and on the banks of the Avon is a mine of ironstone, which, however, has not been wrought for many years. In the limestone quarry on Hilderston hill, silver-ore was formerly found, but not of any purity, or in quantity adequate to the expense of extracting it. The rateable annual value of the parish is £6,644. The seats are, Wallhouse, Cathlaw, and Lochcote, the last a modern mansion, which, when completed, will be an elegant structure. Bridgecastle, formerly the seat of the earls of Linlithgow, still retains vestiges of its ancient character, and some of the venerable trees by which it was surrounded are in good preservation. Behind the old mansion-house of Craw Hill, on the banks of the Avon, is a chasm called Wallace's cave; and in some clefts in the rock are fine specimens of mosses, of several rare varieties. About two miles to the south-west of Bridgecastle (NS 94261 70945) are the foundations of the castle of Ogilface (NS 92707 69013), the ancient seat of the family of De Boscos, barons of Ogilface, and which was a place of considerable strength. There are some vestiges of the castle of Bedlormie (NS 87470 67334), comprising a square tower with a vaulted roof; also remains of the castle of Kipps (NS 98744 73921), of similar character, but smaller dimensions. The village of Torphichen, consisting of scattered clusters of houses, is pleasantly situated. The inhabitants are chiefly employed in agricultural pursuits and in the quarries; there are likewise two corn-mills, two flax-mills, and two mills for the spinning of wool, part of which is manufactured into shawls. Blackridge is in the western portion of the parish, near the river Avon; it is noticed under its own head. Facility of communication with Linlithgow and the other towns in the neighbourhood is maintained by good roads; the Linlithgow and Glasgow, and the Edinburgh and Glasgow, turnpike-roads passing through the parish. The ecclesiastical affairs are under the superintendence of the presbytery of Linlithgow and synod of Lothian and Tweeddale. The minister's stipend is £163 13s 7d, of which £25 7s are paid from the exchequer; with a manse, and a glebe valued at £12 per annum: patron, Lord Torphichen. The church, which is adjacent to the ancient commandery, near the eastern extremity of the parish, is a neat building erected in 1756, and containing 550 sittings, of which all are free. A church has been erected in the village of Blackridge, and the members of the Free Church have a place of worship. There are parochial schools at Torphichen and Blackridge; the master of the former has a salary of £34 4s 4d, with a house and garden, and his fees average about £14. There are also parochial libraries in both villages. Several stone coffins of rude construction have been found on the high grounds above the Logie burn. George, son of John Stone and Agnes Arthur of Lockcoal (? ), baptised May 1, 1715, witnessed by Alexander Marshel of Cathlaw and James Thochloun (?) of Hilderstoun. Christian, daughter of Alexander Arthur of Torphichen and Jean Arthur, baptised June 26, 1715, witnessed by John Lightbody and William Jack. John, son of Alexander Arthur of Torphichen and Jonet Hastoun, baptised January 22, 1716, witnessed by John Muirhead and John Arthur the younger. William, son of Alexander Robert and Elizabeth Arthur of Couchill (? ), baptised March 4, 1716, witnessed by Andrew Brock of Goremyre (NS 97644 72881) and John Thomson. Anna, daughter of Alexander Robert and Elizabeth Arthur of Couchill, baptised September 11, 1717, witnessed by Wellhouse (?) and Bridgehouse (?). Martha, daughter of John Arthur and Jean Inglis, baptised February 22, 1719, witnessed by Paul Lindsay and Alexander Arthur. Grissel, daughter of Alexander Arthur and Jannet (Jennett) Haston, baptised February 15, 1720, witnessed by John Arthur and William Jack. Doratur, daughter of John Arthur and Jean Inglis, baptised July 29, 1721, witnessed by Paul Lindsay and James Carlile. Robert, son of John Arthur and Janet Young of Hilderston (NS 98449 71789), baptised November 19, 1722, witnessed by James Thorntoun and David Aitken. John, son John Arthur and Jean Inglis of Torphichen, baptised February 21, 1723, witnessed by Paul Lindsay and Alexander Arthur. Margaret, daughter of John Arthur and Janet Young of Hilderston (NS 96942 71139), baptised July 27, 1724, witnessed by David Aitken and William Donaldson. Alexander, son of John Arthur and Jean Inglis of Torphichen, baptised April 11, 1725, witnessed by John Arthur the elder and Alexander (?) Arthur. Margaret, daughter of John Arthur and Janet Young of Hilderston (NS 96942 71139), baptised September 19, 1725, witnessed by William Arthur and David Aitken. Alexander, son of John Arthur and Janet Young of Hilderston (NS 96942 71139), baptised July 11, 1727, witnessed by David and William Aitken. Alexander, son of Alexander Arthur and Janet Haston of Torphichen, baptised September 29, 1728, witnessed by John Arthur the elder and younger. Janet, daughter of John Arthur and Janet Young of Hilderston (NS 96942 71139), baptised July 13, 1729, witnessed by David Aitken and John Davie. Agnes, daughter of John Arthur and Janet Young of North Hilderston, baptised January 14, 1731, witnessed by David and William Aitken. Mary, daughter of William Marshall and Margaret Arthur of Torphichen, baptised July 20, 1731, witnessed by Paul Lindsay and Peter Lermouth. Ann, daughter of Alexander Arthur and Margaret Trottar of Clints (? ), baptised July 27, 1731, witnessed by Alexander his son and John Marshall of Torphichen. James, son of William Arthur and Mary Johnston of Bathgate paroch, baptised August 20, 1732, witnessed by Robert Arthur and John Marshall. 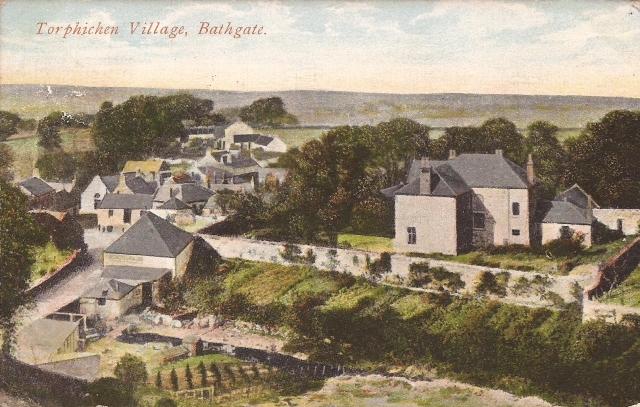 This entry also appears in the Bathgate parish register. John, son of John Arthur and Janet Young of North Hilderston, baptised October 31, 1732, witnessed by David Aitken and William Arthur the younger. Elizabeth and Jean, daughters of William Arthur and Mary Johnston in the paroch of Bathgate, baptised January 6, 1734, witnessed by Robert Arthur and David Aitken. John, son of Alexander Arthur and Margaret Trottar of Torphichen, baptised May 26, 1734, witnessed by Alexander Arthur and James Liddle. Mary, daughter of Alexander Arthur and Margaret Trottar of Cants (?) of Torphichen, baptised April 23, 1736, witnessed by Alexander Marshel and John Kirk. George, son of John Arthur and Jannet Young of North Hilderston, baptised August 6, 1736, witnessed by David and William Arthur. Katharine, daughter of Alexander Arthur and Elizabeth Young of Bathgate paroch, baptised August 8, 1736, witnessed by David and William Aitken. Jannet, illegitimate daughter of Cristian Kellie, begotten in fornication with John Arthur son to Alexander Arthur, baptised December 14, 1736, witnessed by William Marshall and William Muirhead. Jean, daughter of William Arthur and Mary Johnston of North Hilderston, baptised May 14, 1738, witnessed by Robert and John Arthur. John, son of Robert Arthur and Margaret Meek of Cathlaw, baptised September 10, 1738, witnessed by John Meek and William Arthur. James, son of Alexander Arthur and Margaret Trottar of Clints (?) of Torphichen, baptised November 26, 1739, witnessed by David Rick (?) and James Liddle. Helen, daughter of John Arthur and Jannet Young of North Hilderston, baptised July 28, 1739, witnessed by John and Robert Arthur. William, son of Robert Arthur and Margaret Meek of Cathlaw, baptised April 20, 1740, witnessed by James Petticrew and James Taylor. Jean, daughter of William Arthur and Mary Johnston of North Hilderston, baptised June 9, 1740, witnessed by Robert Arthur and John Meek. James, son of Robert Arthur and Margaret Meek, baptised December 31, 1741, witnessed by William Arthur and Patrick Meek. William, son of William Arthur and Mary Johnston, baptised August 8, 1742, witnessed by Robert Arthur and John Meek. William, son of Alexander Arthur and Mary Trottar of Clints, baptised February 27, 1743, witnessed by William Marshel and Alexander Arthur of Torphichen. Margaret, daughter of Robert Arthur and Margaret Meek of Cathlaw (NS 97878 72087), baptised November 2, 1743, witnessed by William Arthur and William Aitken. Christian, daughter of Robert Arthur and Margaret Meek of Cathlaw (NS 97878 72087), baptised October 28, 1744, witnessed by James Pettigrew of Slackend (NS 97088 72146) and William Arthur of North Hilderston. Robert, son of Robert Arthur and Margaret Meek of Cathlaw (NS 97878 72087), baptised March 22, 1747, witnessed by Alexander and John Arthur of Torphichen. Alexander, son of Robert Arthur and Margaret Meek of Cathlaw (NS 97878 72087), baptised June 5, 1748, witnessed by William Arthur of North Hilderston and William Aitken of Torphichen. Dorothea, daughter of John Arthur and Agnes Meikle, baptised May 10, 1752. Martha, daughter of John Arthur in Torphichen and Agnes Meikle, born September 28, 1754 and baptised October 13. William, son of Alexander Arthur and Agnes Provan of Linlithgow, baptised August 12, 1762, witnessed by David Millar and John (?). Andrew, son of Robert Arthur and Mary Waugh of Easter Redburn (NS 88824 67307), baptised April 11, 1765, witnessed by James Marshel and John (?). Alexander, son of John Arthur and Loretta Pottar (Parker) of Torphichen, baptised February 23, 1766. Alexander, son of Mary Arthur begotten in adultery, baptised April 11, 1766, witnessed by John Millar and Andrew Broak. James, son of James Arthur and Elizabeth Whyte, born on June 23, 1766 in Linlithgow, West Lothian - film 1066632,102988. Elisabeth, daughter of Robert Arthur, tennant of Redburn (NS 88651 67313), and Mary Waugh, baptised May 8, 1767. Charles, son of John Arthur and Loretta (Dorothy,Dorythu ?) Potter of Torphichen, baptised March 11, 1770 witnessed by John Deall and Andrew Broak. Magdeline, daughter of John Arthur and Mary Heart of Torphichen, baptised July 11, 1770, witnessed by James Paton and William Heart. William and Mary, twins born to Robert Arthur and Mary Waugh of Easter Reidburn (NS 88824 67307), baptised August 16, 1770, witnessed by John Leslie and (?) Waugh. Alexander (? ), son of James Arthur and Elizabeth White of Cathlaw (NS 97878 72087), baptised October 6, 1772, witnessed by John Arthur and Peter White. William, son of James Arthur and Elizabeth White of Cathlaw (NS 97878 72087), baptised August 28, 1774, witnessed by James Robinson and David Thomson. James, son of James Arthur and Elizabeth White of Cathlaw (NS 97878 72087), baptised January 3, 1776, witnessed by William Arthur and James Walker. Mary, daughter of William Arthur and Elisabeth Hutton of Bishoprie (NS 97380 71154), baptised February 18, 1776, witnessed by John Wardrobe and Patrick Gray. Janet, daughter of William Arthur and Janet Hutton of Bishoprie (NS 97380 71154), baptised June 5, 1778. Isabel, daughter of John Arthur and Elizabeth Wood of Torphichen, baptised January 12, 1780 (March 11 ? ), witnessed by John Wardrobe and John Walker. Helen, daughter of John Arthur and Betty Wood, baptised November 9, 1781, witnessed by William King of Birkenshaw and John Young, portioner of Bridgehouse (NS 93543 71546). Robert, son of James Arthur and Janet Walker of the Wester House of Bedlormie (NS 87572 67335), baptised January 8, 1783, witnessed by James Paul and Matthew Steel. William and Jean, twins born to William Beveridge and Elisabeth Arthur of Torphichen, baptised March 7, 1783. Margaret, daughter of William Arthur and Janet Hutton of Bishopbrae (NS 97412 71145), baptised March 19, 1784, witnessed by Peter Aitken and William (?). Agnes, daughter of John Arthur and Elisabeth Wood of Torphichen, baptised March 19, 1784, witnessed by William Arthur and David Marshall the elder. No name, son of James Arthur and Janet Walker, baptised July 17, 1785, witnessed by Robert Arthur and David (?). Ann, daughter of William Arthur and Janet Hutton, baptised August 19, 1786, witnessed by Pater Arthur and James (?). Elisabeth, daughter of John Arthur and Elisabeth Wood of Torphichen, baptised March 26, 1786, witnessed by William Arthur and David Marshal. William, son of James Arthur and Janet Walker of Longside, baptised October 29, 1786, witnessed by Alexander Reid and Christian Marshal. John, son of John Arthur and Elisabeth Wood of Torphichen, baptised May 18, 1788, witnessed by William Hay and John Simpson. Mary, daughter of James Arthur and Janet Walker of Badlormie lands (NS 87572 67335), baptised April 15, 1789, witnessed by James Paul and William Arthur. Alexander, son of Alexander Arthur and Isobel Hamilton of Torphichen, baptised November 19, 1789, witnessed by William Arthur and David Marshall. James, son of John Arthur and Elisabeth Wood of Torphichen, baptised October 11, 1790, witnessed by John Wood his father in law and William Arthur. Jean, illegitimate daughter of Jean Arthur born in adultery, baptised January 20, 1791, witnessed by Patrick Marshal and John Walker. Margrat, daughter of Alexander Arthur and Isobel Hamilton of Torphichen, baptised March 14, 1791, witnessed by William Arthur and John Walker. Elisabeth, daughter of Robert Arthur and Elisabeth Bennet of Easter Red Burn (NS 88824 67307), baptised April 24, 1791, witnessed by James and John Arthur his brothers. James Arthur and Janet Walker of Lands of Bedlormie (NS 87572 67335) had a son baptised June 3, 1792 called James, witnessed by Robert Mils (?) and Matthew Steils (?). Robert Arthur and Elisabeth Bennet of Reid Burn (NS 88824 67307) had a daughter baptised September 5, 1792 called Jannet witnessed by William Arthur and John Walker. James Russell and Isabel Arthur of Cathlaw had a son baptised October 9, 1792 called James witnessed by William Arthur and David Marshall. Robert Arthur and Elisabeth Bennet of (?) had a son baptised November 16, 1792 called Robert witnessed by James Paul and John Arthur. James Arthur and Jannet Walker of the Lands of Bedlormie (NS 87572 67335) had a daughter baptised July 12, 1794 called Jean witnessed by Robert Arthur and John Arthur his brother. James Russell and Isabel Arthur of Cathlaw had a daughter baptised July 27, 1795 called Elisabeth witnessed by William Arthur and David Marshall. James Arthur and Jannet Walker of Longside had a son baptised March 29, 1797 called John, witnessed by James Marton and Marey Marton. Margrate, daughter of Andrew Arthur and Margaret Shanks of (? ), baptised June 19, 1797, witnessed by James Hutton and Thomas Hutton. William Arthur attended most baptisms conducted in the parish church during the last decade of the 18th century and may have had an official position within the church such as Elder or Warden. James Russell and Isabel Arthur of Hilderston Hills (NS 98087 71706) had a son baptised June 29, 1798 called William, witnessed by James (?) and John Walker. Robert Arthur and Elizabeth Bennet of Eastercraig had a daughter baptised October 16, 1798 called Margaret witnessed by Peter Bennet and William Arthur. John Arthur and Elizabeth Wood of Torphichen had a daughter baptised May 5, 1799 called Marion witnessed by John Walker and James Whillan. Thomas Arthur and Agnes Walker of Torphichen had a daughter baptised May 5, 1799 called Jannet witnessed by John Walker and James Whillan. Andrew Arthur and Margaret Shanks of Badlormie house had a daughter baptised May 30, 1799 called Mary. Thomas Arthur and Agnes Walker of Torphichen had a son baptised November 16, 1800 called John. Robert Arthur and Elizabeth Bennet of Blackridge had a daughter baptised January 7, 1801 called Isabel. James Russell and Isabel Arthur of Hilderston Hills had a son baptised March 29, 1801 called John. Peter Crawford and Jannet Arthur of Torphichen had a son baptised April 24, 1802 called Alexander. Robert Arthur and Elizabeth Bennet of Blackridge had a son baptised March 27, 1803 called James. James Russell and Isabel Arthur of Hilderston Hills had a son baptised April 3, 1803 called Alexander. Thomas Arthur and Agnes Walker of Torphichen had a daughter baptised April 3, 1803 called Agnes. Peter Crawford and Janet Arthur of Little Cathlaw had a daughter baptised January 29, 1804 called Janet. William Downe Gillon, son of Robert Hay and Magdlane Arthur of Walhouse, baptised March 4, 1804. James Russell and Isabel Arthur of Hilderston Hills had a son baptised May 24, 1805 called Thomas. Robert Hay and Madline Arthur of Walhouse had a son baptised July 28, 1805 called John. Peter Crawford and Janet Arthur of Little Cathlaw had a daughter baptised March 16, 1806 called Marion. Robert Arthur and Ann Hutton of Badlormie had a son baptised August 24, 1806 called James. James Russell and Isabel Arthur of Hilderston Hills had a daughter baptised June 7, 1807 called Agnes. Thomas Arthur and Agnes Walker of Torphichen had a daughter born September 3, 1807 and baptised September 13 called Mary Robertson. Robert Hay and Magdlane Arthur of Walhouse Gate had a son born on October 18, 1807 and baptised November 8 called Andrew Gallon. Peter Crawford and Jannet Arthur of Cathlaw had a son baptised April 3, 1808 called William. Robert Arthur and Ann Hutton of Blackridge had a son baptised September 4, 1808 called Thomas. John Hunt and Margaret Arthur of Cathlaw had a daughter baptised November 14, 1808 called Isabel (Mabel ?). Proclamation of James Aitken and Anne Arthur, both residing in this parish, on April 8, 1809. James Arthur (Aitken ?) and Anne Arthur, both of Torphichen, proclaimed April 9, 1809. June 19, 1809 - By cash from John Arthur for the second mortcloth used to his deceased daughter. July 30, 1809 - By cash from John Arthur for the second mortcloth used to his son John Arthur (5s). James Russell and Isabel Arthur of Hilderston Hills had a son baptised September 17, 1809 called George. Robert Hay and Magdalane Arthur of Walhouse Gate had a son born April 20, 1810 and baptised April 30 called James. Peter Crawford and Janet Arthur of Cathlaw had a son baptised May 6, 1810 called John. Robert Arthur and Agnes Hutton of Blackridge had a daughter born August 15, 1810 and baptised September 9 called Margaret. James Aitken and Agnes Arthur of Torphichen had a son born September 12, 1810 and baptised September 23 called William. John Hunt and Margaret Arthur of Cathlaw had a son born November 5, 1810 and baptised November 22 called John. Alexander Arthur of the parish of Bathgate and Margaret Brown of this parish proclaimed December 2, 1810 (2s 6d). April 7, 1811 - By cash from John Arthur for the second mortcloth used to his wife Elisabeth Wood (5s). James Arthur and Margaret Pettigrew, both of this parish, proclaimed November 3, 1811 (5s). Peter Crawford and Janet Arthur of Cathlaw had a son born November 10, 1812 and baptised November 22 called James. James Russell and Isabel Arthur of Cathlaw hills had a daughter born November 21, 1812 and baptised December 13 called Jean Burns. James Aitken and Ann Arthur of Torphichen had a daughter born March 28, 1813 and baptised the same day named Janet. September 26, 1813 - By cash from William Arthur for the best mortcloth used to the deceased George Meikle. James Arthur and Jean Denham of Torphichen had a son born September 30, 1813 and baptised December 12 called John. October 6, 1813 - By cash from James Arthur and Jean Denham being a fine exacted from them for their irregular marriage (5s). April 18, 1814 - By cash from Thomas Arthur for the second mortcloth used to Agnes Hart. May 1, 1814 - By cash from James Arthur for the second mortcloth used to his deceased wife Jean Denham. June 29, 1814 - By cash for the best mortcloth used to the deceased William Arthur of Little Cathlaw (6s 8d). September 11, 1814 - By cash for the best mortcloth used to the deceased Thomas Arthur (6s 8d). George Povan and Janet Arthur of Broompark (NS 96277 72009) had a son born September 1, 1814 and baptised September 11 called Michael. Peter Crawford and Janet Arthur of Cathlaw had a son born January 25, 1815 and baptised February 20, named Robert. James Aitken and Ann Arthur of Torphichen had a son born August 6, 1815 and baptised August 13 called James. January 7, 1816 - By cash from James Russel for the best mortcloth used to the deceased James Arthur. February 11, 1816 - By cash from James Arthur of Little Cathlaw for erecting a headstone in the churchyard. James Russell and Isabel Arthur of Cathlaw had a son born February 11, 1816 and baptised March 3 named Archbald. March 24, 1816 - By cash from James Arthur for the best mortcloth used to Jean Arthur (Denham ?) from Linlithgow (10s 6d). Proclamation of James Arthur and Agnes Binnie, both of this parish, on May 19, 1816 - twice in one day (5s). John Hunt and Margaret Arthur of Cathlaw had a son born August 5, 1816 and baptised August 26 named William. James Arthur and Agnes Bennie of Cathlaw had a son born February 6, 1817 and baptised February 23 called William. James Bruce and Elizabeth Arthur of Torphichen had a daughter in fornication born July 4, 1818 and baptised September 29 named Elisabeth. James Arthur and Agnes Bennie of Cathlaw had a daughter born September 24, 1818 and baptised October 25 named Ann. Peter Crawford and Janet Arthur of Cathlaw had a daughter born January 20, 1819 and baptised February 28 named Jean. Proclamation of William Arthur of the parish of Muiravonside and Janet Johnston of this parish on April 25, 1819 - twice in one day (5s). William Arthur and Janet Johnston of Torphichen had a daughter born June 12, 1819 and baptised July 25 named Margaret. George Provan and Janet Arthur of Torphichen had a daughter born June 28, 1819 and baptised November 28 named Janet McCouls. James Aitken and Ann Arthur of Torphichen had a daughter born November 27, 1819 and baptised November 28 named Janet. James Arthur and Janet Graham of Bedlormie Entryfoot (NS 87458 67034) had a son born October 30, 1820 and baptised November 26 named James. David Boyd and Margaret Arthur of Torphichen had a daughter in fornication born February 12, 1822 and baptised April 7 named Margaret. James Arthur and Janet Graham in Bedlormie (NS 87471 67323) had a daughter born August 25, 1822 and baptised September 15 named Mary. James Aitken and Ann Arthur of Torphichen had a son born October 9, 1822 and baptised November 7 named Patrick Wishart. Nisbet Easton and Margaret Arthur of Torphichen had a son born March 17, 1823 and baptised March 29 named John. John Russell and Margaret Arthur of Cathlaw had a son born April 22, 1823 and baptised May 11 named James. William Arthur and Janet Johnston of North Hildertson had a son born July 20, 1823 and baptised August 10 named William. James Arthur and Janet Graham of Bedlormie Entryfoot (NS 87458 67034) had a son born April 13, 1825 and baptised May 8 named John. William Arthur and Janet Johnston of North Hilderston had a daughter born September 21, 1825 and baptised October 16 named Isabella. James Arthur and Agnes Bennie of Bishopbrae (NS 97412 71145) had a son born April 3, 1826 and baptised April 30 named James. John Russell and Margaret Arthur of Hilderston Hills had a son born October 12, 1826 and baptised November 5 named John. James Arthur and Janet Graham of Bedlormie (NS 87471 67323) had a daughter born May 31, 1827 and baptised June 24 named Jean. William Arthur and Janet Johnston of North Hilderston had a daughter born August 19, 1828 and baptised September 14 named Janet. John Russell and Margaret Arthur of Hilderston Hills had a son born September 14, 1828 and baptised October 5 named William. James Arthur and Agnes Bennie of Bishopbrae (NS 97412 71145) had a son born November 2, 1828 and baptised December 7 named John. James Arthur and Janet Graham of Bedlormie Entryfoot (NS 87458 67034) had a son born July 1, 1830 and baptised August 8 named Robert. William Arthur and Janet Johnston of Torphichen had a son born August 31, 1830 and baptised September 26 named John. Five shillings received from James Arthur for the second mort-cloth used for his deceased son J.Arthur. James Arthur and Janet Graham of Bedlormie Entryfoot (NS 87458 67034) had a daughter born August 13, 1832 and baptised September 16 named Janet. Nisbet Easton and Margaret Arthur of Torphichen had a son born January 3, 1834 and baptised January 19 named William. William Arthur and Janet Johnston of Torphichen had a daughter born July 26, 1835 and baptised (?) named Elizabeth. James Arthur and Janet Graham of Bedlormie Entryfoot (NS 87458 67034) had a son born December 30, 1835 and baptised February 15, 1836 named John. Six shillings and eight pence received from James Arthur for the first mortcloth used for his deceased daughter Ann. William Arthur and Janet Johnston of Torphichen had a son born July 18, 1837 and baptised August 27 named John. James Arthur and Janet Graham of (Bedlormie) Entryfoot (NS 87458 67034) had a daughter born July 10, 1838 and baptised August 26 named Helen. Proclamation on January 5, 1840 of Alexander Waddell of the parish of Muiravonside and Elizabeth Arthur of this parish - twice in one day (5s). Proclamation on February 9, 1840 of John Stewart and Agnes Arthur both of this parish. William Arthur and Janet Johnston of Torphichen had a daughter born March 11, 1840 and baptised April 13 named Catherine. Proclamation on June 20, 1841 of John Arthur and Jean More both of this parish - twice in one day (5s). Proclamation on April 14, 1844 of William Arthur of this parish and Agnes Carlaw of the parish of Kirknewton - twice in one day (5s). Two shillings and six pence received on March 4, 1845 at the irregular marriage of Michael Colquhoun and Helen Arthur. Proclamation on July 21, 1845 of James Bryce and Janet Arthur both of this parish - twice in one day (5s). Proclamation on December 9, 1849 of William Arthur and Jean Brown, both of this parish, twice in one day. They were married by the Reverand William Branks on December 21, 1849. Recorded by Ebeneezer Oliphant, Session Clerk. Proclamation on June 23, 1850 of Peter Walker of the parish of Bathgate and Isabella Arthur of this parish, twice in one day. Proclamation on January 8, 1852 of James Arthur residing in this parish and Catherine Arthur residing in the parish of Linlithgow were proclaimed this day in the parish church in order to marriage, the first second and third times. Attested by me, Philip Cameron, Session Clerk. The abovementioned parties were married at Silvermine (NS 98843 71569) on February 13, 1852 by the Reverand William Branks. Proclamation on August 15, 1852 of James Nimmo and Elizabeth Arthur, both residing in this parish, were proclaimed in the parish church in order to marriage, the first time August 8, second and third times this day. Attested by me Philip A Cameron, Session Clerk. The abovementioned parties were married at Torphichen village on August 17, 1852 by the Reverand William Branks, Minister of this parish. Torpichen Manse, December 5, 1852, which day the Session met and was constituted with prayer, sederunt Reverand William Branks, Moderator, and messrs Hay and Calder, Elders, compeared James Nimmo and Elizabeth Arthur his wife confessing to the sin of ante-nuptial fornication. They were solemnly and suitably admonished and absolved and restored to the privileges of the church. Closed with prayer. John Walker and Elizabeth Arthur of Torphichen village had a daughter born July 15, 1854 named Margaret. Proclamation on December 10, 1854 that John Millar and Janet Arthur, both of this parish, were proclaimed in the parish church in order to marriage. The first time was November 26, second time December 4 and third time this day. P Cameron. The abovementioned parties were married by the Reverand D McFarlane of the High Church, Glasgow on December 15, 1854 (2s6d). Not to be confused with Ochiltree in East Ayrshire (near Auchinleck and Cumnock), which village is some 60 miles to the southwest. But it may be said that we are away to Ayrshire again, because Ochiltree is also the name of a parish in that famous classic county. Our own opinion is that when Linlithgow was the seat of Royalty, Lords Riccartoun and Ochiltree held respectively these estates in Linlithgowshire and named them after their larger ones in the west, and hence they continued to hold their names even after they had changed owners. Ochiltree, it appears, was possessed in 1559 by Cardinal Beaton. It is now the property of the Earl of Rosebery, and was at one time believed to be occupied as the family residence of that nobleman. It was an ancient fortalice at all events, and a pretty formidable one in its day. When it was originally built is not now known. It was rebuilt in 1736, but was afterwards allowed to go out of repair, and continued uninhabitable up to 1812, when the holder of the earldom at that time caused it to be put in order, and the tenant of the farm, Mr Robertson and his family, have continued to occupy it down to the present. There are several initials cut out on the triangular stones above the door, but it is difficult to decipher them with any degree of accuracy. The present building is three storeys high; of a square form and must have had turrets at each of the corners, and have covered considerably more space than is now occupies. The peerage of Ochiltree was held, it may be stated, by the family of Colville, and was afterwards acquired by Lord Stewart of Avondale, who procured a patent creating him Lord Stewart of Ochiltree. The peerage became dormant in 1675. The barony however, having passed entire through different transmissions, was about 1817 sold off in different lots to different purchasers. So much for the peerage and barony of Ochiltree in Ayrshire. The name Ochiltree signifies a lofty dwelling place, so that that is certainly an appropriate definition of the Linlithgowshire one. A mere fitting name could not have been given. There is quite a little village with a smithy about Ochiltree Castle. Mr Flint is also tenant of a part of Ochiltree and a younger brother of the present Mr Robertson of Ochiltree Castle, is tenant of Ochiltree Mill Farm situated a little to the south.